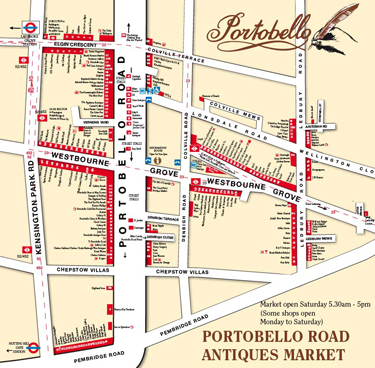 Portobello Road is 3 kilometres west of Marble Arch and easy to reach by road or underground from anywhere in London. There's a choice of two underground stations: Ladbroke Grove (Hammersmith & City Lines) or Notting Hill Gate, which is on the Central, Circle and District lines. The following buses stop in or near the market: 7,12, 23,27, 28, 31, 70, 94, 328. Heathrow Airport Terminals 1, 2, 3 and 4 have taxi and car hire facilities as well as buses and underground trains to the centre of London. There is also an Express train service to London Paddington which takes less than 15 minutes. Gatwick Airport North and South Terminals have a good train service, the Gatwick Express, which leaves for London Victoria every 15 minutes, as well as taxi and car hire facilities.